OUR STAIRS ARE DONE!!! Finally! From, start to finish it took approx. six months! But as my husband likes to say: the turtle always beats the hare. And yes, patience definitely paid off! They are beautiful and exactly what we wanted! If you dare to look back at the before (and progress from week one and week five) these new stairs have completely transformed our home. It’s so airy, and natural light pours in - which is really important in Portland. It definitely makes for a great entrance into the house. 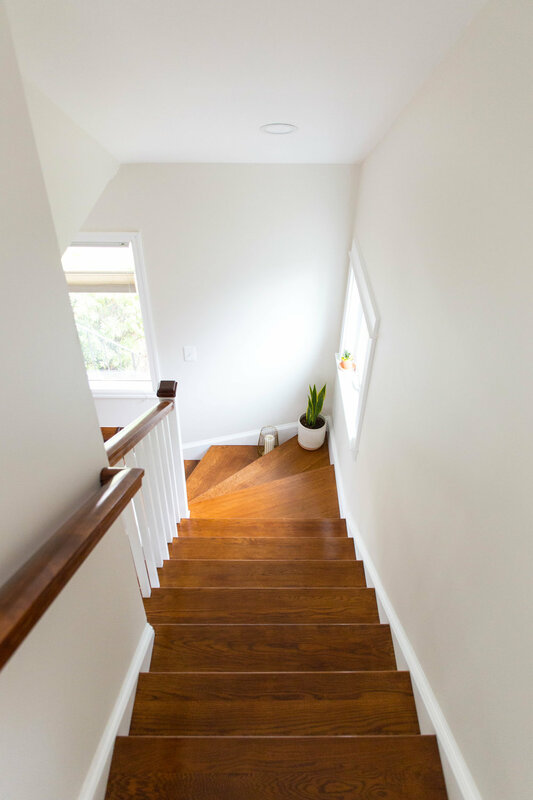 Not only did the stairs turn out better than we thought, but our contractor gave our home a big upgrade with his awesome craftsmanship in the trim and moulding. We went with a base-trim to return the home back to it’s era after numerous previous owners did their own “upgrades.” In this he also added a very simple but very appropriate frame around our new window which I love so much! Eventually every window and door frame will have the same details. 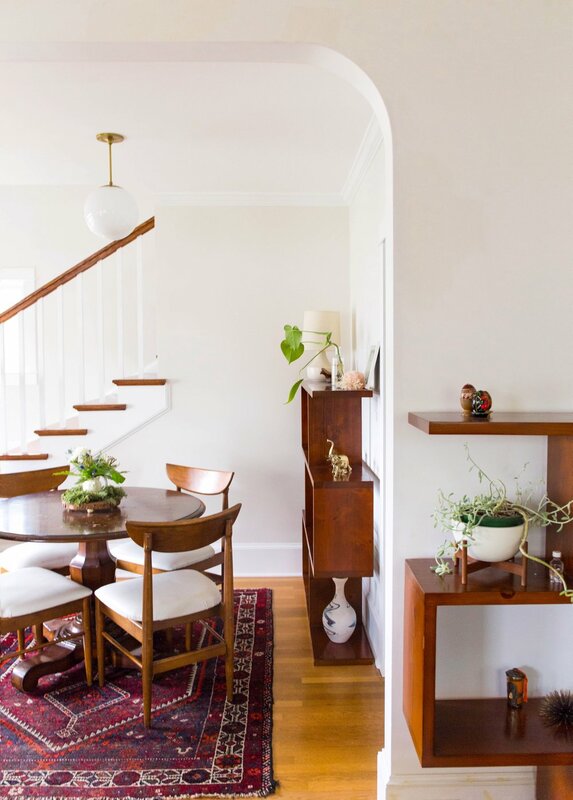 It ties in our mid-century style so well. The new window is also going to be our new standard for the house with the craftsman divided lights. We also replaced all of our floor registers from the dingy ones that were left behind that help tie in our vintage look with an antique brass finish. Picking the right paint and stain was probably one of the most difficult decisions we had to make in this project. Our treads are a gorgeous White Oak but we quickly found out do it’s absorbent nature we would need to use a gel stain that would give us the color we wanted while keeping the integrity of the grain while still being durable. We ended up going with a color called Candlelite that gives a rich tone without being too warm (and it matches our furniture!). Only downside is, gel stains take about five days to dry so prepared for that. Then, I really struggled with the color, because I wanted all white walls, but Danny wanted a contrast between the walls and the trim so we compromised and went with Benjamin Moore’s “Cloud Cover”. It looks more like a Vintage White, and goes nicely with the all the wood. 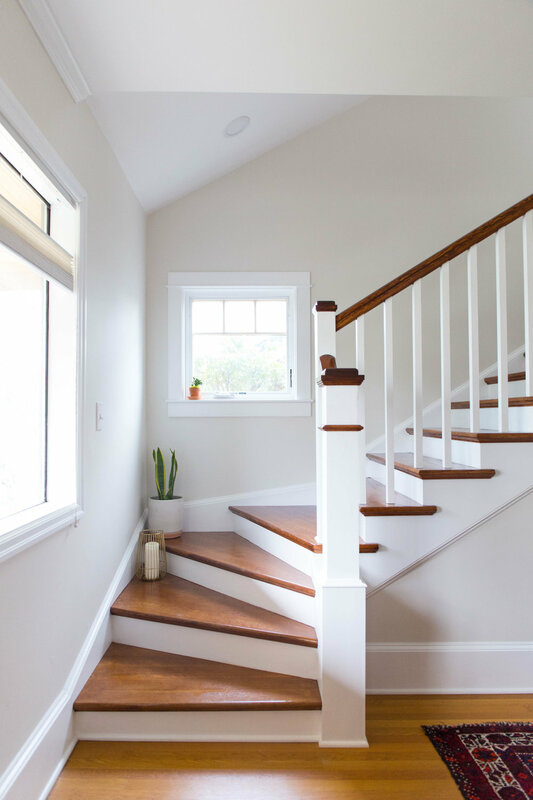 We had originally thought we would do all the painting and staining on our own to save money, but after we realized how tedious it was going to be, we decided to hire out the job - and it was worth every penny spent. The whole process took about a month. After the initial build was complete, Danny and I talked about what the functionality of this room would be besides just the stairs, since it was previously a bedroom. We never envisioned this room to be our dining room, but after placing our table in there while moving the rest of the furniture in from it’s hiatus in storage, it just made sense. The rest of our existing furniture then fit in perfectly, as if it was meant to be. But, the room really came together with the gorgeous light fixture from Schoolhouse Electric. Biggest plus side, now we have a great view of the fireplace while we have dinner or play games with family and friends. We are beyond pleased with how everything came out and could not be more grateful having met the people we did who made this all happen. Now to get some more plants and finish decorating! Thank you so much David & Bryan, Nikole & Tom Peña, Bonnie Johnson, and Emily Moran. You dudes are the best. Xo.